With the introduction of the Olympus µ (mju) 1000, even the most demanding of photographers will be delighted to take pictures packed with 10.0 million pixels worth of detail, using a camera they can simply slip into their pocket. The µ (mju) 1000 retains the hallmark weatherproof metal body of its predecessors, bringing it bang up to date with a sophisticated silver finish, beneath which lies a 10.0 million pixel CCD and a 3x zoom lens (equivalent to 35-105mm on a 35mm camera), that together deliver bitingly-sharp results. The Olympus µ (mju) 1000 offers 20 pre-defined scene modes. Each of these automatically selects the best camera settings for a wide variety of situations, such as Portrait, Landscape, Sports, Cuisine and Candle light. 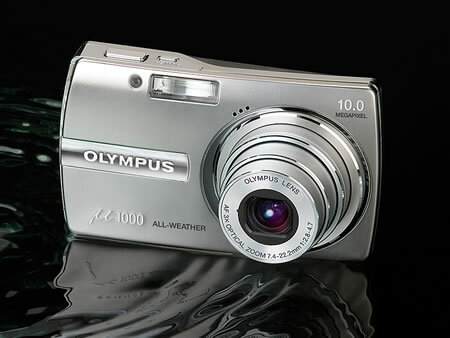 The camera’s Movie mode allows stunning recordings with sound in 640×480 resolution at 30fps, with the duration of the recording limited only by the amount of memory available –camera’s internal memory, or an optional xD-Picture Card.The Olympus µ (mju) 1000will be available in September 2006 with estimated Street Price: $399.99 (U.S.).